Confession: I've never owned a scale or used one regularly. Thus far, I've been one of those lucky people who don't deviate much in terms of weight, so I hadn't seen the need. But when I got pregnant, I decided I wanted to keep track in order to motivate me to gain weight at a reasonable pace. I also wanted to know my pre-pregnancy weight so I could be realistic about what I could expect to go back to in the future. My key requirement was a scale that would connect to the Internet in order to track my weight and show me progress in some sort of an app on my phone. Being able to see that data all in one place seemed like a good motivator. Price: Withings is $30 cheaper at $100 vs $130. Connectivity with activity bracelets: I decided this didn't matter for me, but it might if you already have one and want the coordinating scale. Look and feel of the app. FitBit looked a bit nicer, but this was difficult to validate ahead of time without having an account set up with measurements. Look of the scale: I personally found the Withings a bit more elegant, though they are both pretty similar. Ultimately, price was the deciding factor for me. I gave the Withings a try, liked it, and stuck with it. Before I set out to use a scale, I figured I needed to set a weight goal. I used two sources: Health Canada and BabyCenter Canada. Health Canada has a great calculator in which you can enter your pre-pregnancy weight and height, which it uses to recommend an amount for you to gain during your pregnancy. Based on the above two, my recommended weight gain is between: 25 - 35 lbs (or 11.5 - 16 kg). This means that during my second and third trimesters I should expect to gain about 0.8lb to 1lb a week (or 0.4kg to 0.5kg). Of course, this is just a guide, as I hear you're supposed to put on weight much more quickly towards the end of your pregnancy, and of course every pregnancy is different. So, with that in mind, I set a weight goal of 140lbs, but am prepared to go up to 150lbs. And I'm sure if I go higher than that there will be valid reasons for it, which I'll happily discuss with my healthcare professional. I originally set an incorrect goal in the app, and found I had to go online to set up a new goal that was accurate and would reflect both on the web dashboard and on my phone. Below is a view of the online dashboard after setting up this goal. On the left graph you can see a green bar, which indicates my weight goal in comparison to all off my measurements. On the right you can see that I'm on my way, 12% of the way there. In my case, the percentage is wrong. I set up the revised goal today and I don't know when it started calculating from, but I've actually already gained 8-11lbs since the beginning of my pregnancy when I compare measurements from around the same time of day. I'm pretty sure I'll have gained the recommended amount by my due date of January 2015, and not April 2015! 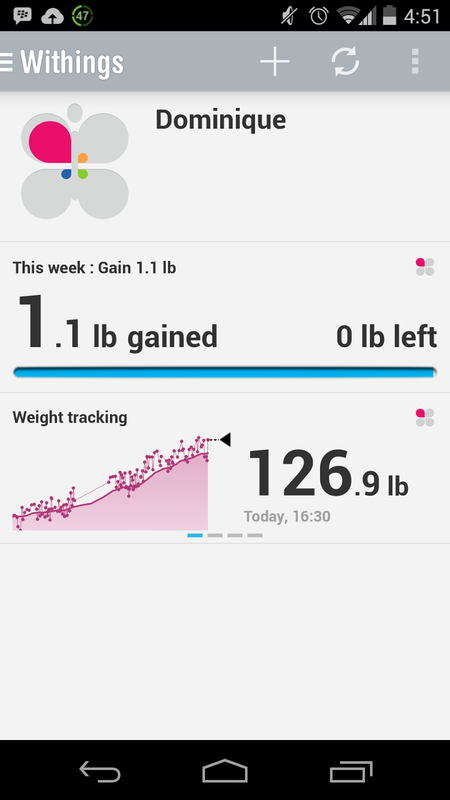 Below you can see the dashboard in the Android app as well as my overall weight chart since I first purchased the Withings Wireless Scale. As you can tell, I haven't been using the weight goal very much as I just assumed it wouldn't make much sense during pregnancy. 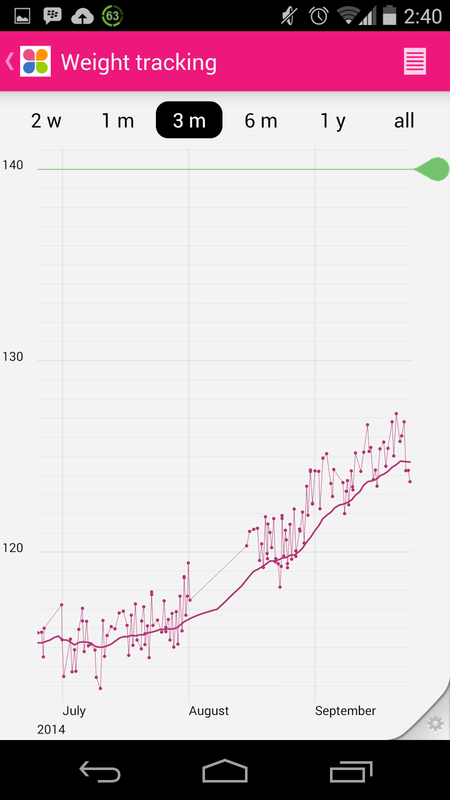 I use the scale to track overall progress, for which I find the graphs have been really exciting to watch. It is nice however to see the green line, which shows how I'm progressing towards my overall pregnancy weight goal. 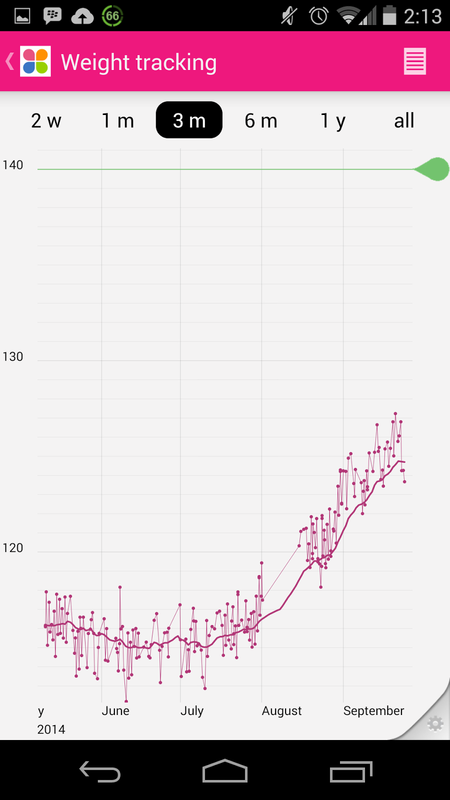 After weighing myself one more time mid-day, when my weight is at its peak, you can see how much more accurate the weight goal data can be. It seems overall that Withings hasn't configured its apps to use average data points from given times to calculate these, but instead uses the very latest measurement. Because my weight easily fluctuates 4 lbs a day, that makes it a less accurate and consistent way to measure progress. 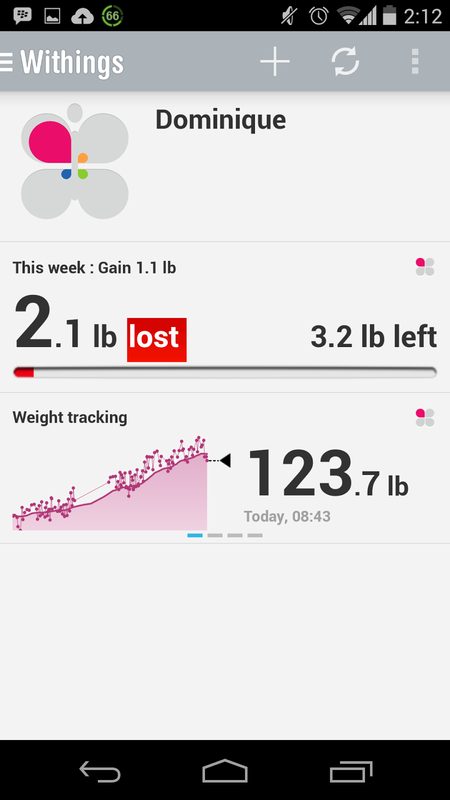 So overall it seems the weight goal can be useful if you're interested in that feature. I would recommend to make it a habit to check the app after weighings at similar times of day. So either always check it at night, or always in the morning if you want to get a progressive, more realistic view. You can see from my charts below that I lost a little bit of weight during the first trimester. Luckily, I can attribute it not to unpleasant nausea, but to no longer drinking such delightfully calorie-intense IPAs! On the right you can see how quickly that's rectified itself in the second trimester, all of the way up to today's measurements at 24w4d. 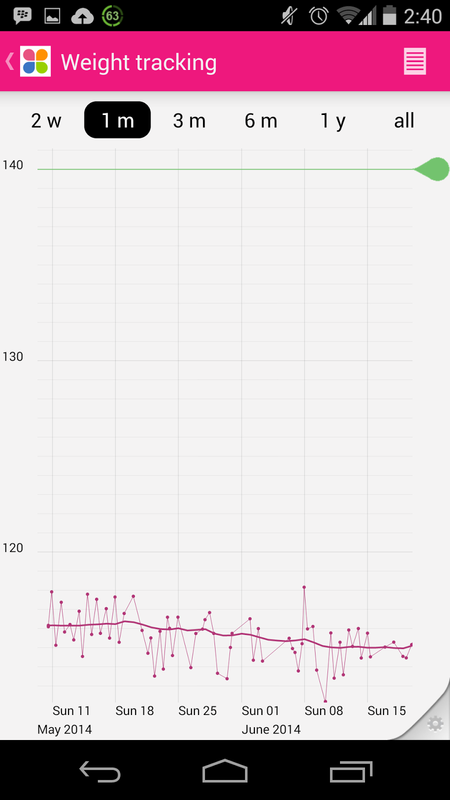 And here's the full graph I see when I log into the web application. The weight and BMI at the top are from an arbitrary point in the first trimester that I happen to have selected. Again, notice the green line with my weight goal clearly highlighted against my measurements. 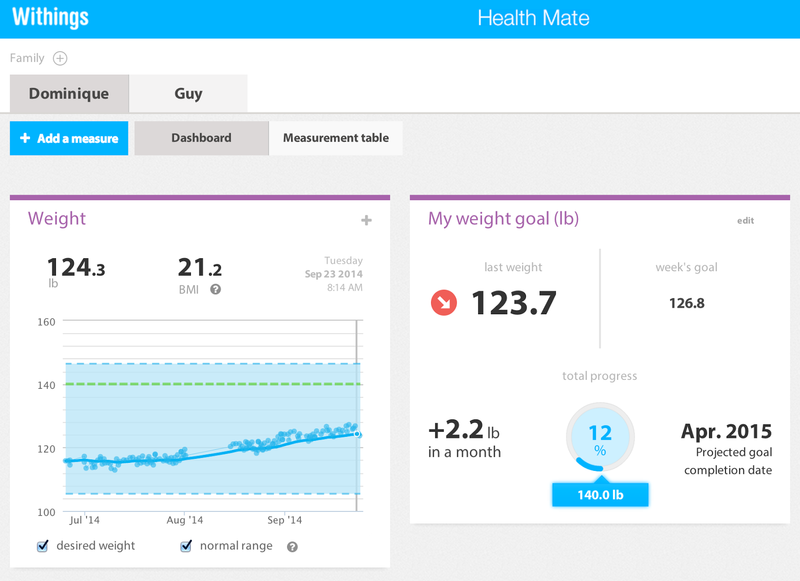 Both the FitBit Aria and the Withings Wireless Scale can track multiple users, and I find it works quite well. Whenever I step on the scale, it recognizes me by name after weighing myself. My partner uses it regularly. We both have access to log in and see all of the measurements on the scale. If guests come over and use it, these measurements don't get assigned to anyone, and we then have the option to discard them or create a new user on the scale. Ultimately, it's just a scale, so it's really up to you. If you like seeing how you progress on an automatically-generated chart like I do, then go for it. I find that it really motivates me. 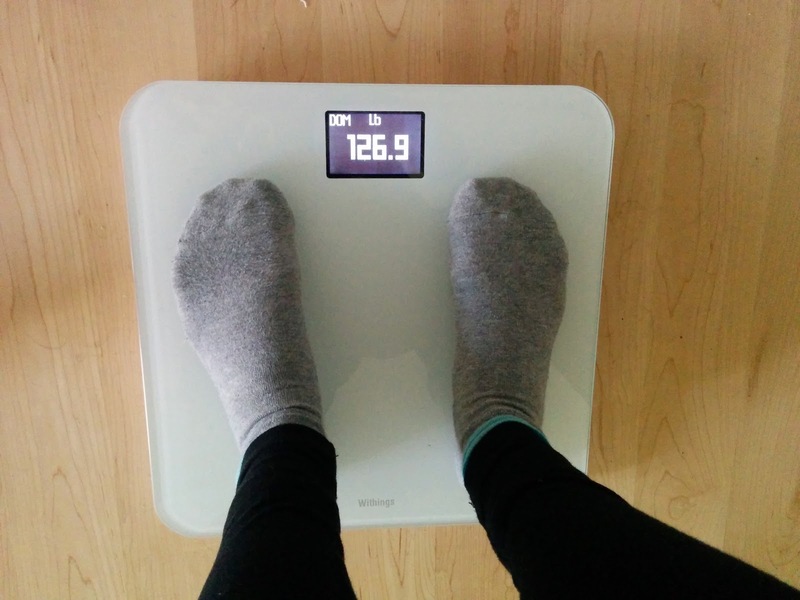 I weigh myself every day in the morning and at night, and love to see how it deviates as my pregnancy progresses. I am not obsessed about weight, so for me it hasn't stressed me out to see that on some days I even gain 4lbs from morning to night, I find it rather fun and motivating to keep eating healthily. The gap you see in the diagrams above is when I went on vacation and (gasp!) didn't bring my scale with me. Otherwise, I've really kept up with weighing myself about twice a day on average, which has been really fun! The true test of course will be when and if I need to start losing weight. I may feel slightly differently after the baby comes along, but we shall see!